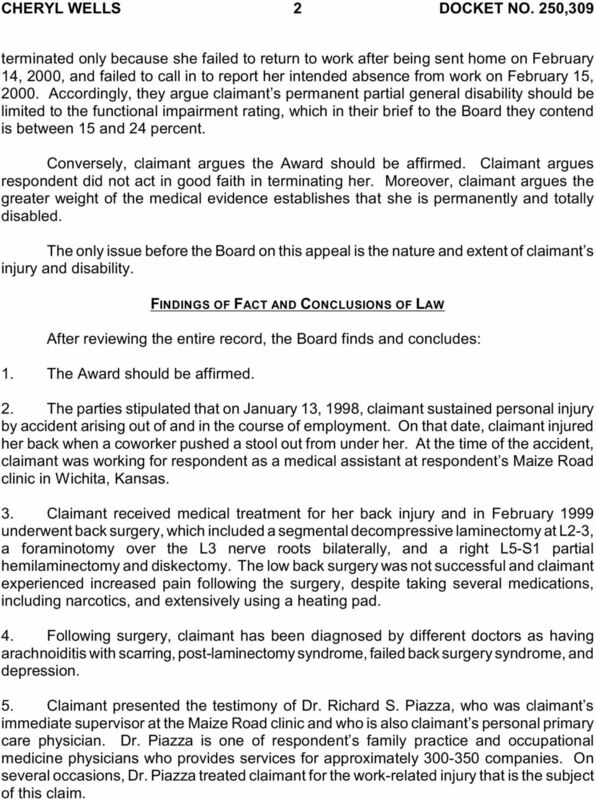 Download "BEFORE THE APPEALS BOARD FOR THE KANSAS DIVISION OF WORKERS COMPENSATION"
2 CHERYL WELLS 2 DOCKET NO. 250,309 terminated only because she failed to return to work after being sent home on February 14, 2000, and failed to call in to report her intended absence from work on February 15, Accordingly, they argue claimant s permanent partial general disability should be limited to the functional impairment rating, which in their brief to the Board they contend is between 15 and 24 percent. Conversely, claimant argues the Award should be affirmed. Claimant argues respondent did not act in good faith in terminating her. Moreover, claimant argues the greater weight of the medical evidence establishes that she is permanently and totally disabled. The only issue before the Board on this appeal is the nature and extent of claimant s injury and disability. FINDINGS OF FACT AND CONCLUSIONS OF LAW After reviewing the entire record, the Board finds and concludes: 1. The Award should be affirmed. 2. The parties stipulated that on January 13, 1998, claimant sustained personal injury by accident arising out of and in the course of employment. On that date, claimant injured her back when a coworker pushed a stool out from under her. At the time of the accident, claimant was working for respondent as a medical assistant at respondent s Maize Road clinic in Wichita, Kansas. 3. Claimant received medical treatment for her back injury and in February 1999 underwent back surgery, which included a segmental decompressive laminectomy at L2-3, a foraminotomy over the L3 nerve roots bilaterally, and a right L5-S1 partial hemilaminectomy and diskectomy. The low back surgery was not successful and claimant experienced increased pain following the surgery, despite taking several medications, including narcotics, and extensively using a heating pad. 4. Following surgery, claimant has been diagnosed by different doctors as having arachnoiditis with scarring, post-laminectomy syndrome, failed back surgery syndrome, and depression. 5. Claimant presented the testimony of Dr. Richard S. Piazza, who was claimant s immediate supervisor at the Maize Road clinic and who is also claimant s personal primary care physician. Dr. Piazza is one of respondent s family practice and occupational medicine physicians who provides services for approximately companies. On several occasions, Dr. Piazza treated claimant for the work-related injury that is the subject of this claim. 3 CHERYL WELLS 3 DOCKET NO. 250,309 Using the fourth edition of the American Medical Association s Guides to the Evaluation of Permanent Impairment (AMA Guides), Dr. Piazza testified that claimant has a 39 percent whole body functional impairment. In that rating, the doctor included the permanent skin discoloration on claimant s low back, which was caused by extensively using a heating pad, giving it a nine percent rating to the whole body. When Dr. Piazza testified in December 2000, he was continuing to treat claimant as her personal primary care physician and, therefore, he was aware of claimant s injury and limitations. When he testified, the doctor thought claimant was essentially unemployable because of the narcotic medications that she was taking. 6. Claimant also presented the testimony of Dr. Jon C. Parks, a board-eligible anesthesiologist, who was claimant s authorized treating physician at the time of his December 2000 deposition. The doctor testified that claimant had post-laminectomy syndrome with low back and bilateral L5-S1 radiculopathic pain, and that claimant was being treated with Ibuprofen, Paxil, Xanax, Lorcet, and Soma. Dr. Parks testified that in the future claimant may need more advanced pain treatment therapy, which might include implanting an intrathecal pump for administering narcotics or implanting a dorsal column stimulator for electrically stimulating the spinal cord. 7. Respondent and its insurance carrier hired Dr. Philip R. Mills to evaluate claimant. The doctor saw claimant in both January and September Dr. Mills diagnosed arachnoiditis with scarring, which he also referred to as post-laminectomy syndrome, and rated claimant as having a 15 percent whole body functional impairment using the AMA Guides. The doctor did not rate claimant s skin discoloration from the heating pad, which Dr. Mills described in his January 17, 2000 report as being the most substantial erythema ab igne that he has ever seen, because he did not believe that it created any functional impairment. 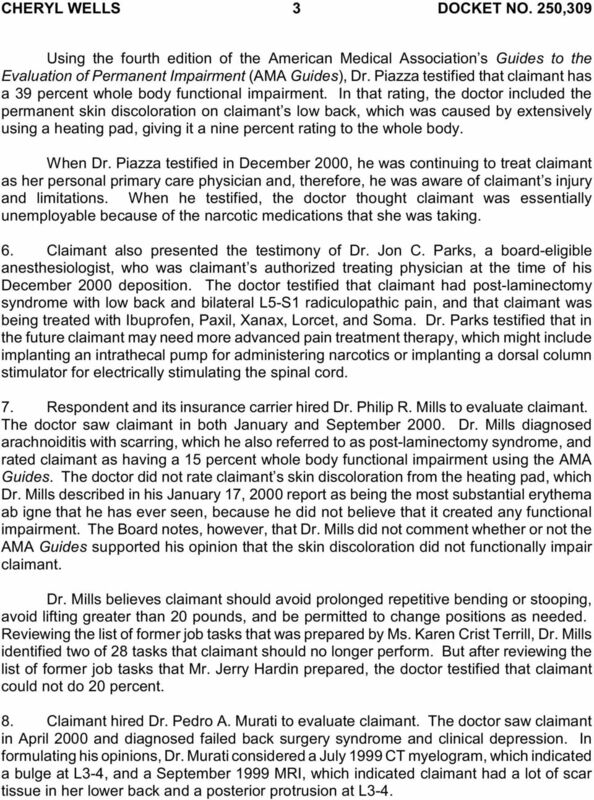 The Board notes, however, that Dr. Mills did not comment whether or not the AMA Guides supported his opinion that the skin discoloration did not functionally impair claimant. Dr. Mills believes claimant should avoid prolonged repetitive bending or stooping, avoid lifting greater than 20 pounds, and be permitted to change positions as needed. Reviewing the list of former job tasks that was prepared by Ms. Karen Crist Terrill, Dr. Mills identified two of 28 tasks that claimant should no longer perform. But after reviewing the list of former job tasks that Mr. Jerry Hardin prepared, the doctor testified that claimant could not do 20 percent. 8. Claimant hired Dr. Pedro A. Murati to evaluate claimant. The doctor saw claimant in April 2000 and diagnosed failed back surgery syndrome and clinical depression. In formulating his opinions, Dr. Murati considered a July 1999 CT myelogram, which indicated a bulge at L3-4, and a September 1999 MRI, which indicated claimant had a lot of scar tissue in her lower back and a posterior protrusion at L3-4. 4 CHERYL WELLS 4 DOCKET NO. 250,309 Dr. Murati rated claimant under the AMA Guides as having a 25 percent whole body functional impairment. The doctor believes claimant is realistically and essentially unemployable. Further, the doctor feels claimant would benefit from a dorsal column stimulator for relieving her back pain and she would also benefit from an epiduroscopy. 9. Before the January 1998 accident, claimant was a registered medical assistant who worked closely with Dr. Piazza. Following the accident, respondent accommodated claimant and initially permitted her to continue working with Dr. Piazza. But in February 2000, respondent determined that claimant should be transferred to a receptionist position in a different clinic, Reflection Ridge, a job in which claimant had no experience or training. Respondent advised claimant that business attire was required in her new position. But claimant reported to work in scrubs on February 14, 2000, and was sent home by her supervisor. The next day, claimant sought additional medical treatment and Dr. Piazza took her off work for two days. On that same day, the doctor s staff faxed the off-work slip to the Reflection Ridge clinic. Respondent then terminated claimant for not working on February 14, 2000, and for failing to work or call in on February 15, Claimant testified that she did not have business attire on February 14, 2000, that she could wear to work. Claimant s supervisor at Reflection Ridge, Kathy McDonald, did not testify. Therefore, claimant s testimony is uncontradicted that she was not told to return to work that day after changing clothes. 11. The Board agrees with the Judge s finding that claimant is essentially unemployable and should receive permanent total disability benefits. Based upon Dr. Piazza s testimony, which the Board finds the most convincing, claimant is unable to work as a result of the back injury and the narcotic medications that she is taking. A worker is permanently and totally disabled when the worker is unable to perform any type of substantial and gainful employment. The Workers Compensation Act provides: Permanent total disability exists when the employee, on account of the injury, has been rendered completely and permanently incapable of engaging in any type of substantial and gainful employment The Board concludes that due to claimant s ongoing pain, her need for narcotic medication, and her need to frequently change positions, claimant is unable to perform substantial and gainful employment. 2 1 K.S.A c(a)(2) (Furse 1993). 2 Also see Wardlow v. ANR Freight Systems, 19 Kan. App. 2d 110, 872 P.2d 299 (1993), where the Court of Appeals affirm ed the trial court which found the worker was perm anently and totally disabled based in part on expert m edical testim ony that the worker was essentially and realistically unem ployable. BEFORE THE APPEALS BOARD FOR THE KANSAS DIVISION OF WORKERS COMPENSATION DENNIS E. BURDETTE Claimant VS. MENNONITE HOUSING REHAB SERV. Respondent Docket No. 1,042,321 AND ACE PROPERTY & CASUALTY INS. 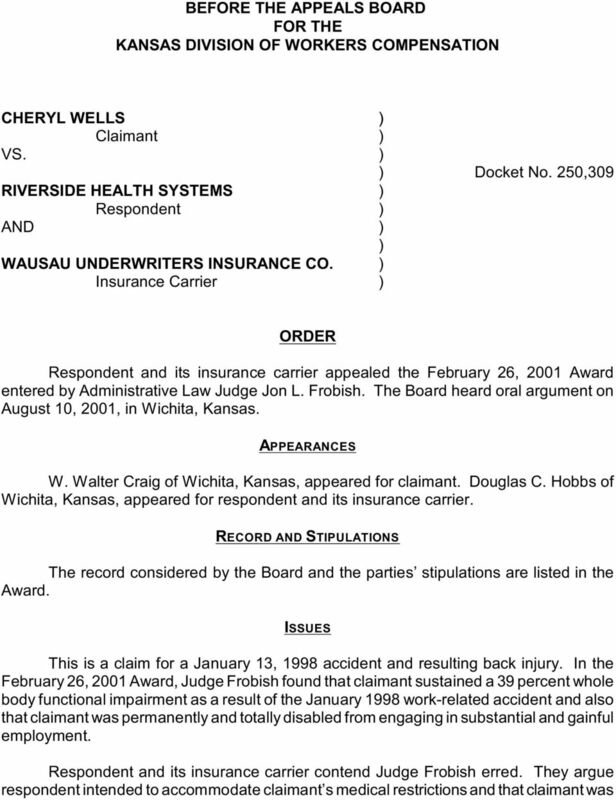 CO.
BEFORE THE APPEALS BOARD FOR THE KANSAS DIVISION OF WORKERS COMPENSATION JERIS L. WUNDERLICH, Deceased Claimant VS. CASEY'S GENERAL STORES, INC. Respondent Docket No. 1,035,955 AND EMCASCO INSURANCE CO.
BEFORE THE APPEALS BOARD FOR THE KANSAS DIVISION OF WORKERS COMPENSATION WAYNE M. McKIBBEN Claimant VS. DRY BASEMENT & FOUNDATION SYSTEMS Respondent Docket No. 1,034,394 AND ACCIDENT FUND INSURANCE CO.
STATE OF MICHIGAN DEPARTMENT OF CONSUMER AND INDUSTRY SERVICES BUREAU OF HEARINGS. Agency No. RICHARD P. BELLANT, PLAINTIFF, 1998 OPINION #328 S T A T E O F M I C H I G A N WORKERS COMPENSATION APPELLATE COMMISSION V DOCKET #96-0089 STATE OF MICHIGAN, DEPARTMENT OF CORRECTIONS, SELF INSURED, DEFENDANT. BEFORE THE ARKANSAS WORKERS' COMPENSATION COMMISSION WCC NO. G DONALD UNDERWOOD, Employee. STEWART STAINLESS SUPPLY, INC.
STATE OF RHODE ISLAND AND PROVIDENCE PLANTATIONS PROVIDENCE, SC. WORKERS COMPENSATION COURT APPELLATE DIVISION FAUSTO MARQUEZ VS. W.C.C. 98-06503 DBC OCCUPATIONS UNLIMITED, INC. FAUSTO MARQUEZ VS. W.C.C. SUMMARY DECISION NO. 143/97. Suitable employment. SUMMARY. Carpal tunnel syndrome; Permanent impairment [NEL] (rating schedule) (AMA Guides) (functional impairment). Warwick v. Howard University, CRB No. 14-112, AHD No. 12-440A, 5 (February 10, 2015). IN THE SUPREME COURT OF TENNESSEE SPECIAL WORKERS COMPENSATION APPEALS PANEL AT JACKSON (May 23, 1997 Session) SHARON RIVERS, Plaintiff/Appellee, VS. CIGNA PROPERTY AND CASUALTY COMPANIES, Defendants/Appellant. IN THE WORKERS COMPENSATION COURT OF THE STATE OF MONTANA 2006 MTWCC 30. WCC No. 2005-1325 DENNIS ZAHN. Petitioner. vs. TOWN PUMP, INC.